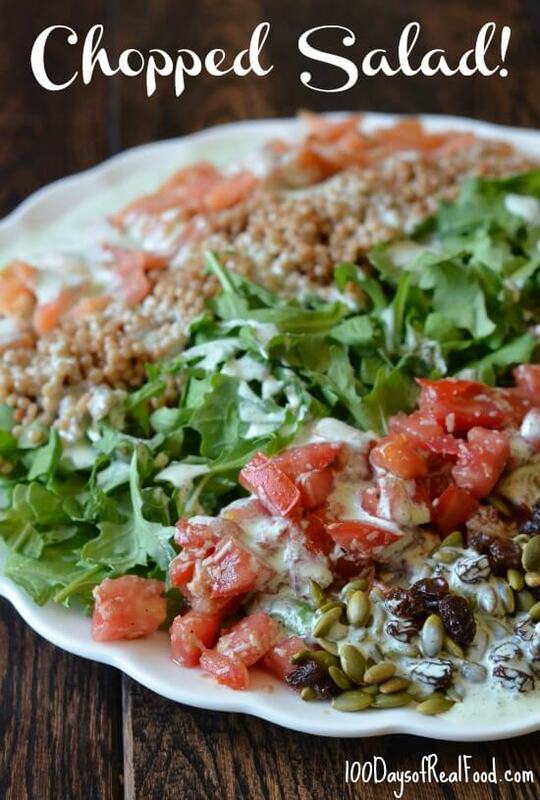 I’m so excited to share my new favorite salad with you! This is one of those meals that you keep thinking about for days. And remember, that’s coming from someone who is not a big salad person (so you know this must be really good)! This Chopped Salad was inspired by the most well-known dish at The Gladly restaurant in Phoenix. I was there a few weeks ago for a conference and was immediately blown away by how good this dish is! All the hype was for good reason, and I hope you enjoy this version. Cook the couscous according to package directions and immediately toss with 1 teaspoon olive oil to prevent clumping. Allow to cool. On a large platter, arrange the arugula in a row down the center. Make a row of the cooked (yet, slightly cooled or cold) couscous next to it. Sprinkle the couscous with a little salt. In a small bowl toss the diced tomato with the Parmesan, 1 teaspoon olive oil, balsamic vinegar, salt, and pepper. Make a row of it on the other side of the arugula. Toast the pepitas in a toaster oven or in a small, dry pan on the stove. They are done when you start to hear a bit of popping. Toss them together with the raisins and place in another row next to the tomatoes. Cut up the smoked salmon and place it in a row next to the couscous. To make the dressing, either whisk together the sour cream, buttermilk, lemon juice, basil, and garlic, or for the best results, quickly blend it together with a hand immersion blender. Pour over top and serve. this sounds delicious! However we don’t like salmon. Would this be good with chicken or a white fish? I really think the smoked flavor of the salmon added a lot – so either smoked chicken or another kind of smoked fish might work as a sub! Ok great thank you! We will try something else and see how it comes out. I knew this salad looked familiar! Good call. :) Fabulous salad! This is my favorite salad from Citizen Public House in Scottsdale! To those who have never had it and don’t like fish, it doesn’t actually taste fishy at all, but I have also made it with shredded chicken, but it wasn’t as good. Can’t wait to try your recipe for it!! What brand did you buy for the smoked salmon? Any suggestions? any recommendations to sub for gluten/casein free? Quinoa? This sounds delish! I can’t wait to make but with our necessary substitutions :) thank you! Quinoa would be GREAT in this salad!! 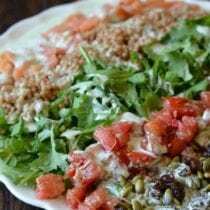 Yep, quinoa is a favorite salad ingredient for me and here are some ideas on dairy free creamy dressings: http://www.mnn.com/food/recipes/blogs/how-to-make-creamy-salad-dressings-without-using-dairy. Hi! This salad is famous here in Phoenix. We’ve been making it for some time – love it! I notice, though, that this version does not include the freeze dried corn (we use organic), which is one of the best things about it – a sweet and crunchy surprise. So nice to see our favorite salad here on our favorite site! This looks amazing…I just added it to my Plan To Eat planner for next week. (LOVE that site SO MUCH…a definite game-changer for me as a busy working mom!) Thanks for all you to help make eating healthy easier for me & my family. I made this for dinner tonight- it was absolutely DELISH! Definitely a keeper! Any suggestions for a buttermilk substitute? Or other recipes that call for buttermilk to use the rest up? I hate to buy it because I never know what to use it for (besides pancakes, which we don’t really eat a lot of) so we always end up wasting most of the container. A good sub for buttermilk is putting 1 tablespoon of either lemon juice or vinegar in your glass measuring cup and then filling with milk to the 1 cup line. Let it sit for a few minutes, it will curdle, and you’ve got buttermilk. I never buy it separate. I don’t have refrigerator space for extra containers, and, like you, it would probably go bad before it’s completely used. You can purchase POWDERED buttermilk. You just mix up (with water) however much you need for your recipe! I find it in the grocery section near the rest of the baking and powdered milk items. Milk, regular milk will be fine in a salad dressing. For baking subbing sour milk (1 tablespoon vinegar or lemon juice) is essential because the acidity needs to react with the soda or baking powder to help it rise but in a salad dressing it is unnecessary. The buttermilk is just a taste preference (unless you want a little more acidity). Kefir will work as well. You can use the rest for anything you would use yogurt for. I love kefir it has more probiotics then yogurt plus good yeast. Its also super easy to make if you find you enjoy it. 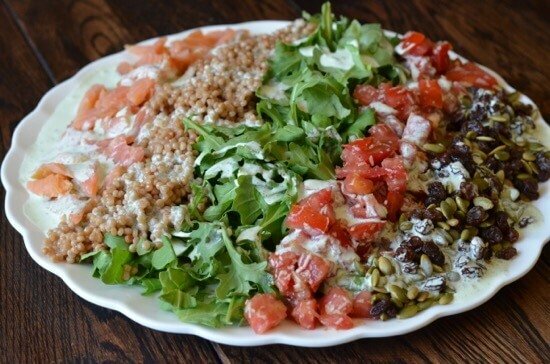 I recently tried this salad at Gladlys and I’m still thinking about it over a month later. It is amazing. I’m am estatic to be able to make it at home. Thank you so much for this post. Yum! Just finished dinner as I LOVED this salad! I didn’t even have smoked salmon and it was great. I was a little skeptical since the ingredients seem pretty basic, but the flavors compliment each other so well! I will definitely try it again with the salmon. Would Greek yogurt work as a substitute for the sour cream? This recipe sounds delicious. This is oozing with color, wholesomeness and arugula! (one of my favorite veggies). Plus, pumpkin seeds and raisins (which I carry in my bag to instantly rid me of the awful hunger pangs) are the icing on the cake. Divine! This recipe was a BIG HIT with my family. We had company and it was fancy and tasty!!!! Made this tonight and it was super yummy. Heads up salmon haters: I really don’t like salmon but I thought I’d give it a shot since I can tolerate salmon as an ingredient in small quantities. When I make this next time I’ll omit the salmon or replace with a bean. I found myself picking the salmon out. I just really don’t like salmon and I’m ok admitting that:) But this is a keeper. The dressing is so simple but delish! I plan to make extra dressing as a dip for carrots and cucumbers! Is there a replacement for butter milk, or a way to make it at home? I hate to buy it for only using that little bit..
Hi Aimee. This will help: http://www.thekitchn.com/how-to-make-a-quick-easy-buttermilk-substitute-cooking-lessons-from-the-kitchn-185757. For anyone else who might want to know. It is approximately 336 calories if you divide the recipe by 4 or 448 if divided by 3. A great way to count calories in a recipe is to log the recipe into a myfitnesspal account (just copy and paste the ingredients over, sometimes you can search the recipe and it automatically adds ingredients, and often credits the site too!). It is best to check the ingredients against the recipe to make sure they are correct and the correct measurement (more times than not they are but sometimes it gets it wrong, i.e. for this recipe it gave me buttermilk bread instead of buttermilk). It also gives you a panel of nutrient details, such as potassium, protein, carbs etc. I think though that if you are eating a predominantly or fully whole foods diet it really isn’t necessary to count calories. A better measure would be to ‘listen’ to your body if it tells you it’s full and stop eating. That is difficult for many to do after years of not eating consciously, so one may need to practice it. (I’m just learning this myself, but am also logging calories for the time being after illness where eating is difficult, and so this has been requested by my doctor. ).